Skin cancer occurs when certain types of cells in your skin become damaged, causing them to grow uncontrollably and form tumors. Every cell in your body contains a microscopic molecule called deoxyribonucleic acid (DNA). DNA contains basic genetic instructions that tell your cells how to function. These instructions govern how your cells behave, grow, and reproduce. Scientists believe that exposure to ultraviolet (UV) radiation is the cause of more than 90% of skin cancer cases. UV radiation is another name for the light and heat created by the sun or indoor tanning lamps. Exposure to the sun or tanning lamps increases the risk of all types of skin cancer. People who experience prolonged exposure to UV radiation during childhood, particularly if they experience severe sun burns, are more likely to develop melanomas and basal cell carcinomas later in life. There are three common types of skin cancer: basal cell carcinoma (BCC), squamous cell carcinoma (SCC), and melanoma. Each type of skin cancer is named for the type of cells where the cancer begins. Several other types of skin cancer exist, but are extremely rare. 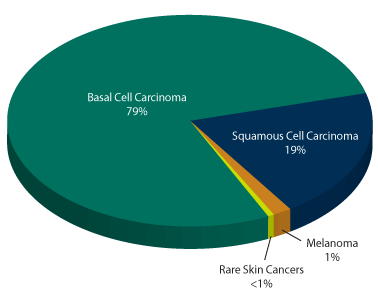 Basal cell carcinomas, named for the cells in the bottom layer of the epidermis, are the most common type of skin cancer tumors and are the least dangerous of the three. Squamous cell carcinomas, named for the cells that are in the middle layer of your skin, are less common but more dangerous—if left untreated, squamous cell carcinomas may cause significant disfiguration. While squamous cell carcinomas are capable of spreading to other parts of your body, they are rarely fatal when treated promptly. Melanoma, named for the melanocyte cells that create the pigment that gives skin its color, is the rarest of the three main types of skin cancer, but is the most likely to spread to other parts of your body. Melanoma is the most dangerous type of skin cancer and can be fatal. Treatment for skin cancer will depend on the type of skin cancer and the stage. Learn more about skin cancer treatment options below. Chemotherapy – Chemotherapy may be used to treat advanced stages of melanoma. This type of treatment is often not the first choice of treatment for skin cancer, however. Radiation – Radiation therapy for non-melanoma skin cancer is an effective alternative to surgery. This type of treatment has minimal side effects, scarring and quick healing. Surgery – Surgery is a common skin cancer treatment. Several factors will be considered if surgery is the best treatment, including where the cancer is, skin cancer type and size. If you’re interested in radiation therapy as a method for skin cancer treatment, contact the board-certified physicians at SERO today. With cancer treatment centers in Charlotte, NC and surrounding locations, we are proud to serve individuals from across the Southeast.